At Temple Shalom, strength, joy, and purpose abound in our contemporary approach to Jewish worship. Experience our warm and family-friendly atmosphere. Explore the richness of our evolving tradition. Lift your voice as your spirit resonates to the sound of our musical and liturgical heritage. And celebrate the diversity we call family. Children are welcome at every service. Whether you are a familiar face in our congregation, or are worshipping with us for the first time, our goal as a spiritual community is the same: to create a place of warmth and friendship, to balance comfort and challenge, to touch your heart, to make you think – and to foster a loving sense of connection to our Jewish tradition and the Jewish people. These words of welcome are meant to help you become more comfortable with our service and more familiar with our congregation. 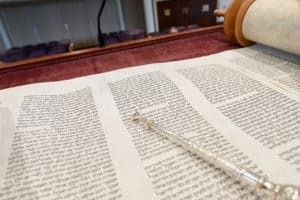 There are a number of customs and traditions of both Jewish services in general, and our congregation in particular, that it might be helpful to share. Most of our services use both a siddur (a prayerbook) and a TaNaKh (a Bible, the Hebrew Scriptures). The prayerbooks are passed out by ushers at the beginning of the service, and the Bibles are found under some seats – usually under every other seat. It is customary to allow neither a prayerbook nor a Bible to touch the ground; should it happen that either one does fall on the floor it is customary to kiss the book as a sign of respect.